Globe valve 113301 has bronze body material that meets ASTM B61 specification and bronze trim along with threaded connection and union bonnet. 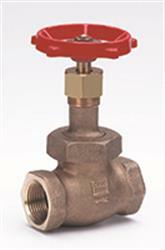 These valves are made to meet the MSS-SP-80 specification. The pressure rating is 200 lb and 400 wog. Not intended for use in potable water.